After watching the 2007 film Smiley Face, directed by renegade queer auteur Gregg Araki — I was left feeling cheated out of the total cinematic experience — at least in a manner comparable to how the ditsy dope smoking debutante in the film feels like after shotgunning the last bit of reef resin out of her $300.00 bong. Before watching Araki's 2010 film Kaboom, I anticipated that the Asian auteur would return to the libertine insanity that made his previous works Nowhere and The Doom Generation such adversely pleasurable experiences. Despite the cheap (yet charming) aesthetic of the film, I am happy to report that Kaboom is another wonderful excursion into the wicked Japanese-American mind of Gregg Araki. Like Araki's previous films, Kaboom combines unrelenting sexuality with science fiction elements, launching the viewer into a world of farcical humor and screw loose sexuality. Also, like Araki's past films, Kaboom follows a young aspiring film student as he encounters various sexual misadventures in a world vacillating nihilism. The film begins with a dream and concludes with a Kaboom, enrapturing everywhere in between. As mAQ also mentioned to me, Kaboom proves that Gregg Araki has still "got it." 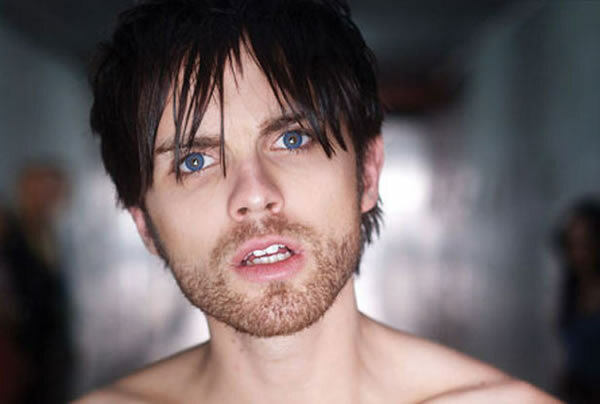 Kaboom follows 18-year-old film student Smith as he explores his "undeclared" sexuality. It is apparent from the start of the film that Smith is a gay boi with a slight interest in AC/DC. Smith's best friend is a lipstick lesbian that enjoys getting her mouth wet on every moist meat curtain she can find. Upon eating a drug-laced cookie at a debauched college party, Smith has a series of reoccurring dreams involving two beautiful women, one with red hair and another with dark locks. To reveal anymore information about Kaboom's plot would ruin the staggering mystique of the film. I will, however, mention that Kaboom features an apocalyptic cult that slightly resembles (in a cheap plastic "user friendly" kind of way) The Process Church of The Final Judgment, which was originally a splinter client group of L. Ron Hubbard's Scientology. Despite being well into his middle age years, Gregg Araki proves he can still keep up with the degenerating times as exemplified in Kaboom, a cinematic time bomb gorged with contemporary societal ills, set to the soothing sounds of a modern soundtrack. When it comes to synchronizing opulent images with audacious audio tracks, Gregg Araki always delivers. I was thoroughly delighted to find out that Kaboom features a melodic neoteric soundtrack, including catchy numbers from bands like the Yeah Yeah Yeahs and Interpol. Due to the film's nonexistent production values and less than stellar acting performances (not to mention the fact that Gregg Araki's favorite star — James Duval — only has a minuscule role in the film), Kaboom is not exactly Gregg Araki's greatest masterpiece. Aesthetically, Kaboom is comparable to earlier Araki low-budget films like The Living End and Totally Fucked Up, minus the vintage charm (only time will whether or not Kaboom also carries this quality). After seeing Araki's masterpiece Mysterious Skin, I assumed that the director would be utilizing larger budgets for his subsequent films. Of course, Gregg Araki is not the kind of film director that is willing to prostitute himself out to the pimps of Hollywood, hence his small, yet loyal fan base. Gregg Araki is an auteur in the truest sense of the word, an artist with a distinct and superlative vision. 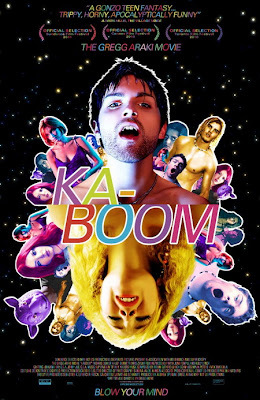 mAQ and I both agree that despite the film's schlocky style and tacked on ending, Kaboom is a worthy addition to Gregg Araki's director filmography. If there ever is a day when an imminent Armageddon scenario comes into play, Kaboom is the film to watch and kick back to, whilst this despairing world withers away. Until that day comes, I will be eagerly waiting for Gregg Araki's next cinematic feature.